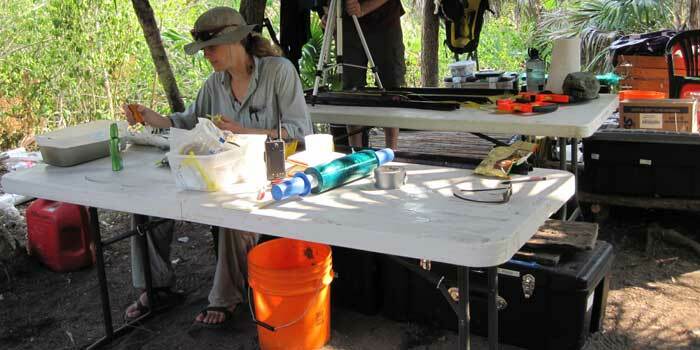 Beverly Goodman is a marine geoarchaeologist who travels around the globe for a job that is full of variety and puzzles! Hear Beverly talk about her job. Download (mp4, 51.6 MB). I am currently actively involved in projects in the Mediterranean, Red Sea and Gulf of Mexico. Do you travel often? To where? It seems like I am always travelling. For field work I travel to the Red Sea (Jordan, Israel), Mediterranean (Israel, Greece, Turkey. Italy), and the Gulf of Mexico (Yucaton). I also travel often for conferences, teaching, and meeting with collaborators. My research requires a Ph.D. Having a Ph.D. makes it possible to apply for research grants, receive permits, and gain university support. My job also requires a lot of scuba training, knowledge of engines and mechanics, electricity, photography. In many ways you have to be a jack-of-all-trades to be able to get things done. The salary greatly varies by country. Currently I am an assistant professor at the University of Haifa—where the beginning salary is around $60,000. It isn’t the most lucrative career, especially given the number of years of study. On the other hand, it is a career that allows me to wake up everyday looking forward to the next task and challenge, and I have the opportunity to work towards improving the planet, which is far more valuable to me than making a lot of money. A research academic position requires a lot of time. Most weeks I am working at least 50 to 60 hours, and during expeditions and field courses that can go as high as 70 or 80! Fortunately I love what I do so it doesn’t feel like ‘work’. The research I do has a lot of variety day-to-day and project-to-project. In many of my projects I collect cores to help reconstruct what the environment of a place looked like in the past. The cores might be collected by hand-hammering into the sea bottom, or in some cases with more specialized dive equipment and complicated air hammer systems. It all depends on the location, water depth, and research question. On other occasions I excavated underwater with a specialized underwater ‘vacuum’ that helps me get the samples that I am interested in. Once the samples are collected they come to the laboratory where they are washed and analyzed to answer questions about the past. Specifically, I am answering questions about where ancient harbors were located and whether they were impacted by disasters such as tsunamis and hurricanes. In addition, I use the same techniques to study the modern impact of fish farming on the sea bottom, explore for new ways to understand climate change, and discover new tools for interpreting ancient marine systems. So many things that I have worked on have been really exciting. For me, it is always exciting and surprising when I come across archaeological artifacts that are very personal in nature, things like hair combs or shoes. Once I came across one 2000-year-old leather sandal, and all I could think was, ‘I hate it when I lose one shoe!’ I imagine that person 2000 years ago getting very annoyed when his shoe went overboard! My work allows me to be in the sea regularly, satisfy my curiosities about how people lived in the past, and I have the opportunity to discover information that can help us improve the world we live in and prepare better for the future. The past is a window into the future, and by reconstructing the histories of our coastline we can know what could be waiting for us in the future. My modern environmental work gives guidelines for how much the environment is being impacted by human activities. My research provides important information for coastal management and planning which impacts the public positively by making better decisions. My research area is very broad, so there are many directions someone with my background could choose, such as education, environmental planning, underwater archaeology, coastal engineering. My family always supported my desire to work in the ocean—my first dive certification was a graduation gift. I also had a few creative and energetic teachers along the way who entertained my crazy ideas. I am mostly happy with the path I chose, my one regret is not sailing around the world on a tall ship. Perhaps I will still do that! The most difficult obstacle for me was not knowing how to answer the question ‘what do I want to be when I grow up’. Somehow ‘underwater coastal geoarchaeologist’ was never on a list of options! I bounced around a lot between programs and institutions in my first 2 years of studies. I always had many favorite subjects and many possible paths. Ultimately, I decided to study everything that interested me, and I was fortunate to find my niche—but no one could have pointed the way for me. Today I use a little bit of all the things I studied (physics, photography, anthropology, archaeology, geology), and nothing went to waste. Hobbies? What is that? Truthfully many of my favorite pastimes are part of my daily work, so I feel like my work itself is a hobby! But when I do step away from work I love to read fiction, plan house renovations that will never happen, breed simple aquarium fish, cook, hike, bicycle, and garden.